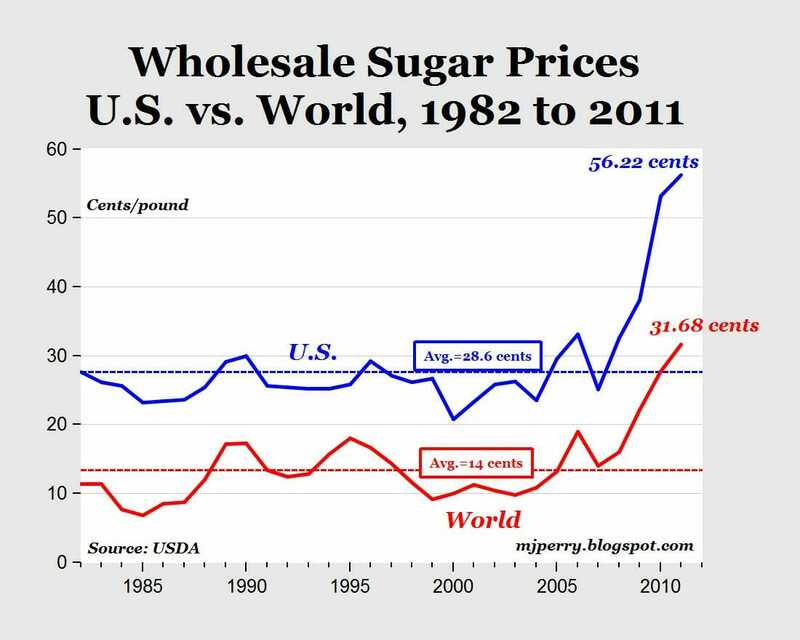 For the last 10 years or so, HFCS-42 has actually traded at a price higher than the world market price for sugur, but lower than the US price for sugar. There is a lot complexity to prices, but this seems to imply that HFCS would not be nearly as attractive a substitute for sugar if US sugar tariffs did not exist (not to mention subsidies of corn which support HFCS). This can also be seen in the fact that HFCS has not been used nearly so often as a sugar substitute in markets outside of the US, even by the same manufacturers (like Coke) that pioneered its use in the US. President Obama used a lot of his state of the union address again teeing up what sounded to me like a new round of protectionism. Protectionism is the worst form of crony capitalism, generally benefiting a handful of producers and their employee to the detriment of 300 million US consumers and any number of companies that use the protected product as an input. The NY Times has a fairly ugly story, though hardly unique, of a project to restore water flow to the Everglades turning into a corporate welfare project for United States Sugar. The short story is that in a time when United States Sugar was in desperate financial straights and when real estate prices in Florida were tumbling, the Florida government treated USS like it had all the power, rolling over to paying above-market prices and letting USS pick and choose the land parcels to be purchased. The story did not mention much about it, but there is a second large sugar producer in the area who it strikes me could have been played off against USS to get the best deal. 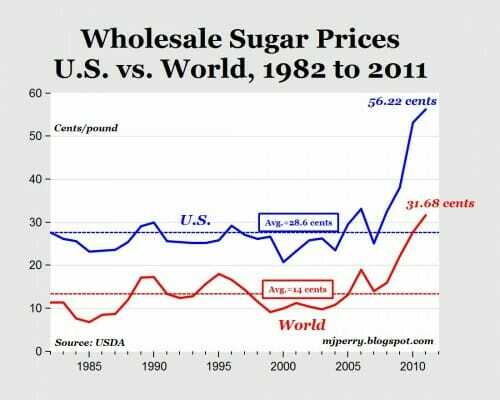 Remember that the US Sugar operation likely exists only because of sugar tariffs and import quotas that raise the price of sugar in the US well above the world norm. So consumers are paying extra, and drinking soft drinks with crappy HFCS, so that US Sugar can screw up the Everglades and get bailed out by taxpayers. Readers will understand it is the purest coincidence that US Sugar's attorney is chief of staff to the state's governor. when the stakes of government are so high, money and influence never goes away. Just as in any economy, when you ban money, a barter economy arises. So if we ban large campaign spending, then the quid pro quo becomes grass roots efforts and voter mobilization. Groups like the UAW become more powerful (we are seeing that already). They are trading their member's votes for influence. Connected companies like GE are doing the same thing, trading their support for legislation that is generally hostile to commerce for specific clauses in said legislation that exempts GE and/or makes the laws even more punishing on their competition. The problem with all this activity is it is hard to see and totally unaccountable "” at least with advertisements we see people out in the open with their agendas. For its board members, Mr. Crist's overture was appealing in part because they figured a government purchase would be far more lucrative than a private deal. "It wasn't another company coming in and bottom-fishing you," Mr. Wade said. "They knew it would be for fair-market appraisals." Over at my privatization blog, I wrote about a deal in Chicago where the government made four or five huge mistakes in issuing a private contract that a private company (or at least one that is not going to go bankrupt) would never make. So of course the problems are blamed on privatization. I just finished "The Box," which is a history of container shipping. Never has any book I have read elicited so many laughs from my family. Nothing says "geek" like reading a book about shipping containers. But, for those of you who might similarly be turned off by the subject matter as unpromising, I can say this is easily one of the most interesting business books I have ever read. It is fascinating to see how the entire economics of an industry can be changed not by some arcane advance in silicon, but by a metal box. In a period of about 20 years, the entire merchandise shipping business, which had remained virtually unchanged for thousands of years, was completely reinvented. Every ship and every port had to be replaced. Moreover, these changes resonated far beyond shipping, as they enabled much of the global manufacturing revolution of the last generation. Because pre-container shipping and transport were so highly regulated, the book provides a great window on how regulation affects innovation, and vice versa. It also focuses quite a bit on how unions and in particular union work rules affected industry economics, and how these unions reacted to change in the industry. Is being a first mover an advantage, or a disadvantage? Sea-Land reaped a number of first mover advantages, but it also got hurt badly when a number of the earlier investment choices they made turned out to be wrong. Several late movers, who invested after ship designs had been through two or three generations, did quite well. Others did not. Who makes money investing into this kind of change? A few early SeaLand investors made out well, the equivalent of angel investors, but later investors did poorly. And it is not at all clear that anyone making massive, billion dollar investments ever really made great returns. Like the airline industry, the industry quickly hit over-capacity and prices dropped. It is clear shippers won big, but did it really make sense for anyone to invest in this business? The best strategy I can come up with was followed by Maersk, which basically sat out until late and then bought up assets on the cheap out of bankruptcy from early participants. This situation was reminiscent of a business case I had at HBS about the beginnings of the high fructose corn syrup (HFCS) market. It was run as a computer simulation among teams. Basically, almost not matter what everyone did, the industry ended up in over-capacity and everyone lost money. The only successful strategy was the Wargames approach ("the only winning move is not to play').